Pests in the garage can range from a minor annoyance to major financial loss. Nobody wants to work in a garage with flies, mice, or roaches. These pests can ruin your belongings by chewing and nesting in them. So let’s get rid of all the creepy-crawly things that are trying to make your garage their home. 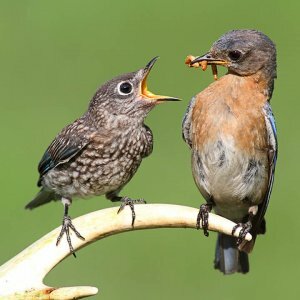 I’ve given each pest their own section and include some ideas on why they are coming in, how to get rid of them now, and how to keep them from coming back. A lot of these tips are going to be about reducing the pests reasons for coming into your garage in the first place. If you get rid of these attractions that is most of your battle. 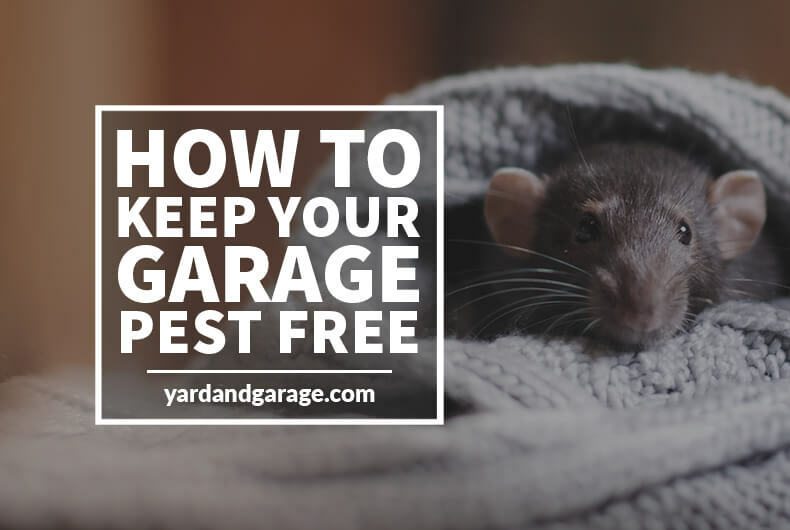 Now, on to the ultimate guide to keeping your garage pest-free. If you leave your garage doors open all the time expect a bird to drop in. You don’t want bird poop all over your tools, so keep your garage door shut when it doesn’t need to be open. If a bird does make its way in you can either leave it alone for a while and see if it will leave by itself or use the broom method. The broom method is finding a long-handled broom and put the bristles close to the bird. Don’t whack it, you don’t want to hurt the poor thing. What usually happens is the bird flies to the other side of the garage instead of straight out. So, keep up with the annoying broom trick and eventually, he will leave. Rarely a bird will get so tired of flying around that it will drop to the floor. Gently scoop it up into a dustpan and then place it outside in some protective cover like under a bush or tree line. He’ll get his strength back in a few minutes and fly away. Now, shut your garage door. 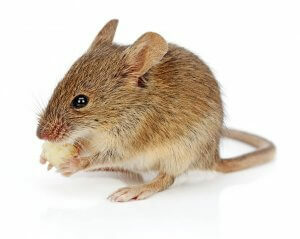 Mice will destroy nearly anything they can get their nasty little teeth into. Favorite targets of mice are furniture padding and clothes. They love building nests out of these materials. I keep my garage mice-free by keeping it clean and having things stored up off the floor. A mouse would love to nest in a pile of clothes you leave out in your garage. Keep everything sealed tightly in plastic tubs so they won’t chew their way in. Also, don’t keep any food in your garage as that will definitely attract them. If you do get a mice infestation the only recourse I have found helpful are mice traps. The old snap kind that you bait with cheese work well. Put one in the corner along the wall where they travel. I don’t recommend using poison to kill mice. What happens is they eat the poison and then go off into a crevice to die, leaving you wondering where that stench is coming from. Get rid of the mice before the next visitor on the list comes calling, the snake. Snakes. My arch nemesis. I have a phobia of those vile creatures. Snakes are always on the lookout for their next meal. Get rid of things they eat like mice and lizards and eventually they will go away too. If one finds its way in your garage I would very carefully try the broom trick. Have an escape plan ready! If it is a venomous snake I will probably suit up like Robocop and go after it with a hoe. 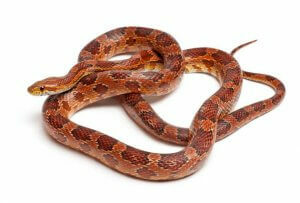 Keeping your grass cut low and taming any wild areas in your yard will help lower your snake population. They will look elsewhere for a meal. My wife is terrified of spiders but they don’t bother me too much. I try not to kill them as they help keep the insect population down. If you find yourself face-to-face with a spider roll up some newspaper and give it a whack. A shoe also works great. Be careful when you are putting on boots or gloves that you have stored in your garage. A spider could have made its home there. Shake out the boots and gloves before wearing them. Keeping your garage clean and free from other insects will help control the spider population. I’ve found they like to lay eggs underneath shelving or furniture that is stored in the garage. If you notice webs, sweep them out and tackle the bugs they are after. Roaches are attracted to wet and damp areas so this may indicate you have a moisture problem. If you’ve got water leaking into your garage look into putting in a french drain. Also, check to make sure your gutter drains are flowing correctly. Keep your garage floor clean as well. Hiring a regular pest company will help with insects. There are always going to be bugs trying to get in your house. They outnumber us 200 million to one! Ants will come into your garage searching for food and water. Remove those two issues and they ants should go away as well. If you find a stream of ants running along your garage walls, don’t reach for the spray just yet. If you kill these workers with spray the queen will just pump out more workers. You need to get to her, and that means finding the ant nest. I live in the south and fire-ant nests are easy to find, especially after a storm. If you have another type of ant infesting your garage the nest might not be so easy to spot. Follow the workers’ line back to the nest and set out some ant killer. It is usually granules or flakes. Just spread it around the nest, not on top of it. You don’t want to aggravate them so much they want to leave for another nest. A few days is all it takes to get the workers to get the bait and take it to the queen. Keep your garage floor clean (I’m starting to sound like a broken record here) and don’t leave out any food. Lizards eat other insects to like the spider, they are coming into your garage looking for food. So their presence usually means other insects are present. The same rules apply here, keep the garage floor clean and keep as much stuff off the floor as you can. Lizards like to hide in dark places, so if you store things like an old headboard or plywood against the wall they will call it home. Contrary to their name, these large flying bugs do not eat mosquitos. Too bad. They do freak out wives with their large size though. Also known as crane flies, these bugs spend their life as a grub eating the roots of your grass. In their flying stage, they are most likely attracted to lights in the garage. Be sure to keep the garage door shut and turn off the lights when not using it. Grubs can destroy your lawn so I would contact a pest professional to treat your yard. Another annoying flying insect is the moth. While not dangerous to humans the larvae can eat your stored clothes. Keep any fabrics or clothing you have in the garage sealed up tightly in a plastic bin. Moths are attracted to your garage light so turn them off when not in use. Flies like to hatch their young in dead things, decaying meat or rotting organic matter. Try and see if there’s a dead animal nearby, like a squirrel outside the garage in a bush. Hopefully, it’s not the bird you chased out earlier! You can use fly paper similar to the kind shown below from Amazon or fly traps to get rid of the ones you see now. If they are attracted to your compost bin, be sure you aren’t putting meat into it. Move the bin to a far point in your yard. Having a wasp net in your garage can be a dangerous affair because some people are allergic to wasp stings. Wasps will make their nests almost anywhere as long as there is a sturdy and horizontal base from which they can hand their nest. They mostly choose a corner where their nest will be protected. If you keep trash in the garage, this could be the reason wasps are attracted to the garage. This is because wasps eat other bugs that are attracted to the trash. If you have noticed a wasp nest in the garage, wait till night to get rid of it. This is because wasps are less active in the night making it easier to get rid of the bugs. Purchase wasp sprays in any of the hardware stores. Wear protective clothing, spray the wasp nest directly. You might be required to do this severally to make sure they are all dead. To keep wasps out for good avoid keeping trash close to or in the garage. Ensure that all fruit and vegetable waste is wrapped in plastic before being thrown into the trash. Limit the water sources for the wasps. You can also set up wasp traps around the garage. Hornets are quite sizable about an inch long and they are usually very aggressive when compared to wasps. Removing a hornet’s nest can be quite dangerous because they do not just sting once, they sting continually until they are sure the enemy is dead. Dealing with hornets can be difficult because they are usually located in concealed areas. If the nest is small you can simply use a brick and flatten it. However, if the nest is larger do not use a brick. Purchase a pressurized hornet jet spray. Jet spray is better because it has greater force and distance, you can, therefore, spray if you are a few feet away. After purchasing spray it at around 9 pm when the hornets are asleep in the nest. Spray directly into the nest and leave the garage. After all the hornets are out, you can safely remove the empty nest. Hornets feed off food such as rotting fruits and garbage. Therefore, ensure that all trash is kept out of the garage or close to the garage. Also, set up a couple of traps to prevent wasps from reentering the garage. Bees will get into the garage through small holes probably around pipes or fan outlets. They might be attracted to light if you had left a light on in the garage. Dealing with bees living in the garage can be easy or difficult depending on whether the hive is exposed. Wait until the evening before spraying pesticide on the hive. If you find activity around the hive the next day, spray it again until they are all gone. After all the bees are gone, it is time to remove the hive to avoid wax and honey melting and destroying your walls. If the hive was inside the walls, it is always a good idea to call a professional to handle it. Bees are usually attracted to sweet smells and are repelled by pungent smells. Therefore, if you want to prevent bees from re-entering the garage use bee repellents. Sprinkle garlic powder in the areas that the bees usually congregate. Close all gaps and other access points using a sealant such as insulation foam. You can also place cinnamon around the garage, this will repel the bees in the future. 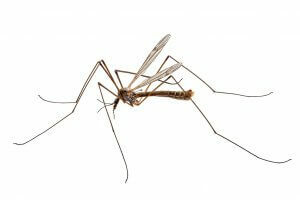 Mosquitoes will invade any space in the house as long as they can find their way inside. The itchy mosquito bite is not the only menace but can also be a health hazard. To kill mosquitoes that are already in the garage, spray insecticide in the garage. Pay more attention to the corners of the floors and ceiling and also behind any furniture in the garage. Standing water is one of the breeding grounds for mosquitoes. Ensure you drain clogged garage gutters and puddles of water in the driveway. Also, drill holes at the bottom of recycling bins so that they can drain excess water from the bin. Also be mindful of puddles of water that might be forming on the garage floor because of a roof leak. To prevent mosquitoes from entering the garage, install a screen door. It is a great way to enjoy fresh air in the garage without inviting mosquitoes. Seal all holes and cracks around the garage that could serve as entry points. Use mosquito repellent or traps to deter mosquitoes from entering your garage. You can also grow plants that repel mosquitoes such as lavender, basil, and rosemary among others. Worms will be attracted to your garage if there is excess moisture in the garage. Therefore the best way of dealing with the worms is by using a dehumidifier to remove the excess moisture. You can also use fans around the house to achieve air flow. Next, you have to seal any entry points for the worms. To do this you need to seal any cracks in the foundation and around cables and wires entering the house. Also, avoid using mulch in your garden surrounding your house. To deal with worms already in the house you should use pesticides that can be purchased online or from the store. After the worms are dead, ensure you clear them to avoid staining from the rotting worm. Pill bugs usually live and breed in moist and decaying organic materials. Their favorite spot will be in wet mulch and under potted plants. They usually get into the garage under doors and around ground level windows. They get indoors after their habitat gets too wet or too dry. The best way to handle them in the garage is by vacuuming them before they die. Seal up any cracks and gaps that they can use to enter the house. You can also get rid of them by removing any soft and decaying materials from around the house. You can also avoid using mulch when farming.